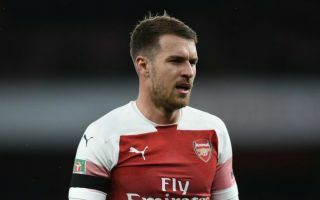 Martin Keown has conceded that he is bitterly disappointed that Arsenal are set to lose Aaron Ramsey this summer when his contract expires. As noted by Sky Sports, the Welshman is expected to move on this summer and join Italian giants Juventus, ending his stint with the Gunners. Having played a key role in their win over Chelsea on Saturday evening, Keown lamented the fact that his former club have allowed the midfield ace to run his contract down and leave for nothing, with his move to Turin a sign of just how good he is. It seems a rather strange decision to let him leave not only given how important Ramsey still is for Unai Emery this season, but also with regards to the fact that they’ll be losing him on a free at the end of the campaign. The 28-year-old has publicly revealed that it was the club who opted to withdraw their renewal offer, as per the Guardian, and so Keown is arguably reflecting the general mood among supporters as they will undoubtedly be disappointed to be losing such a key player as he continues to show that he still has a big role to play for the club.